Mister Rogers arrives with materials to make a "welcome home" sign for the McFeelys. In the kitchen, he uses a marker to decorate the flag-shaped sign. Mr. McFeely stops by to thank Mister Rogers for his help with the Speedy Delivery service while he and Mrs. McFeely were away. In the Neighborhood of Make-Believe, several neighbors have gathered at the castle in anticipation of Mr. McFeely's return. Lady Elaine Fairchilde becomes frustrated when Mr. McFeely's arrival takes longer than expected but his eventual return makes her feel better. When Mr. McFeely notices that Make-Believe is unusually quiet, Lady Elaine invites him inside the castle where a welcome back party is being held in the W Room. Back at the house, Mister Rogers talks about how it can be difficult to wait for someone to come home. Returning the McFeelys' plants to their house, Mister Rogers is delighted to see crafts made by their grandchildren. The McFeelys share a film about their vacation as well as photos of their grandchildren. One photo shows their granddaugther Chrissie wearing braces on her legs. 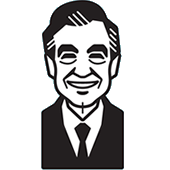 Returning to his house, Mister Rogers talks about physical disabilities.